On Wednesday 14th March the current Board & partners met for a jovial evening at the Wine Chambers Restaurant to celebrate all of our achievements over the past 7 1/2 years. Two founding Board members have retired, including Ken Young (Commemorations Director, back row, 2nd from right) and Chris Mullane (Vice President & Memorial & Garden Project Director, front row right). 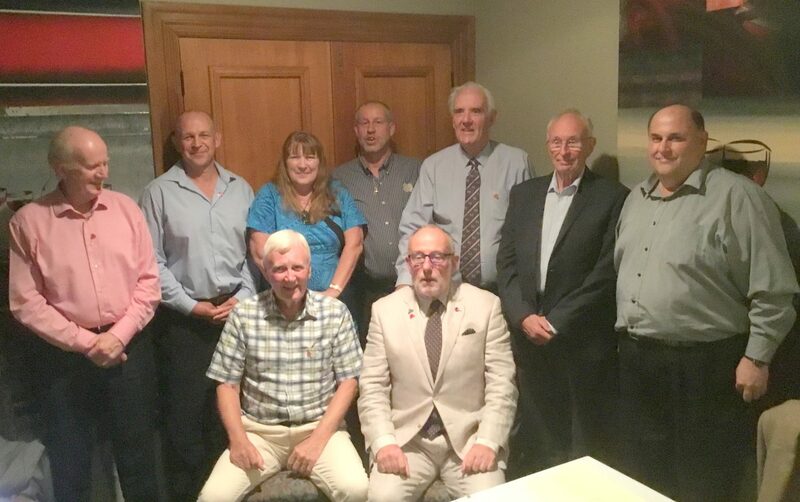 Iain McKenzie (front row left) also stepped down as President, but is staying on the Board as immediate Past President. A huge thank-you to these three hardly suffices for all the hard work they have put into the Passchendaele Society. Facilitate access and promote visits to historic and commemorative sites. Support conservation and interpretation of heritage material from Passchendaele and the Western Front. Maintain contact with the Ministry of Arts, Culture and Heritage and other organisations who share our objectives. Greater knowledge of Passchendaele and the Western Front in young people. We have produced the New Zealand Remembrance Trail to encourage the community to visit Passchendaele and the Western Front. Established a competition “Their Stories-Our Stories” created through Ministry of Education. Presentation at Parliament by Minister of Education. Established a competition created through Ministry of Education “Why I Want To Be In Passchendaele in October 2017.” 10 students were chosen as winners and took part in the New Zealand Memorial & Garden opening in Passchendaele. Planned and created the New Zealand Memorial & Garden in the Passchendaele Memorial Park in Zonnebeke which was opened at the Centennial Commemoration of the Battle of Passchendaele on October 12th, 2017. Supported exhibitions of heritage material supplied by Passchendaele Memorial Museum 1917 (Belgium) and the New Zealand Defence Force. Supported art exhibitions here in New Zealand showcasing the Passchendaele story.